Do Vegans Kill More Animals Than Meat Eaters? Veganism is all about causing the least amount of harm possible. But according to a recent article, due to the process of harvesting crops, vegan and vegetarian diets actually carry a higher body count and environmental cost than their omnivorous counterparts. So is it time for us vegans to get on the grass-fed-beef-bandwagon? Let’s find out. Now, the “recent” article isn't exactly recent. Entitled “Ordering the Vegetarian meal? There’s more blood on your hands,” by Professor Mike Archer, it was originally published in 2011 but recently went viral across Facebook when re-posted by I F*cking Love Science. It was shared over 100,000 times, most likely posted to the walls of vegans with furious gusto in an enthusiastic “gotcha” moment, the most inspired retort to the vegan argument since: “bacon!” Ha! take that, vegans! This, much like “bacon”, is not a new argument, just a repackaged one. And despite my cavalier tone, I do believe that this is an important issue to address. Vegans should be aware of the harm that we do inflict. We are not above the human condition of harming other beings and we should acknowledge this and do our best to reduce our impact. I recently spoke with vegan activist Gary Yourofsky about whether it’s even possible to be 100 percent vegan. You can check out the discussion here–but today we’re going to look at whether or not a vegan diet is truly the best ethical choice. the academic cornerstone of this argument was laid in a 2001 paper by Steven L. Davis, professor of animal science at Oregon State University. Davis wrote a critique on the “least harm” principle proposed by animal rights philosopher Tom Regan. When asked what the difference was between killing a field mouse while cultivating crops and killing a pig for human consumption, Regan said that we must choose the food products that, overall, caused the least harm to the least number of animals. Davis responded to Regan’s assertion that a vegan diet fulfilled this principle with his paper entitled, The Least Harm Principle May Require that Humans Consume a Diet Containing large Herbivores, not a Vegan Diet, in which he asserted just that. This conclusion was echoed ten year later in the recently-made-viral article of Mike Archer. It’s important to note that Archer’s and Davis’ arguments hinge on the comparison of pasture-fed cattle to field animal deaths (from grain harvests in particular in Archer's case). They are comparing the most ideal practice of raising cattle to the least ideal practice of harvesting crops if we were to instead compare deaths of factory farm and other grain-fed animals, which are the vast majority of animals used for food, to field animal deaths, the difference would be laughable. With our modern farming methods, it takes up to 16 pounds of grain to produce one pound of beef. therefore, non-vegans consume, whether directly or indirectly, more than 10 times the plant matter of vegans, thus compounding the deaths of the meat-animals with those of the field animals. This is why Archer advocates the consumption of range-fed cattle for the reduction of both animal deaths and environmental destruction. Setting aside the fact that the overwhelming majority of meat produced in the world is grain-fed, 97 percent in the US and ever-growing internationally, including Archer's Australia, a fact which completely invalidates this entire argument of omnivores causing less harm, let’s look at the viability of grass fed cattle as a primary source of protein. Pasture-raised livestock is not the idyllic picture of environmental sustainability so often painted by its advocates. While there are some advantageous to grass-fed cattle, and it is, in many ways, preferable to feedlots, the rangeland required is incredibly vast. This means habitat destruction on an epic scale coupled with the fact that there simply isn’t enough land to raise sufficient grass-fed cattle to meet current consumption demands. One grass-fed cow requires anywhere from 2.5-35 acres of land depending on the quality of the pasture. The US alone has close to 100 million cattle, which, if using the conservative estimate of 2.5 acres, means 250 million acres of grazing pasture. That is over 390,000 square miles, more than 10% of the entire US. Regardless of these statistics, and the viability of grass-fed cattle, the fact remains that the majority of meat consumed by non-vegans is feedlot meat, which requires an insane amount of crops to produce and places the additional death of field animals on top of the toll of direct deaths by non-vegans. Additionally, non-vegans aren’t excluded from consuming grains directly. In his refutation of Archer’s article, Patrick Moriarty points out the obvious, that, “a hamburger has one layer of meat, but two layers of bun.” And I’d add that not all vegans base their diets on grain products and some vegans (me) don’t consume grains at all. Returning to the issue of field animal deaths, if we take a closer look at Davis’ calculations in the original article, we’ll find his figures circumspect. Gaverick Matheny did just this in his 2003 article on the journal of agricultural and environmental ethics titled, “Least Harm: A Defense of Vegetarianism from Steven Davis's Omnivorous Proposal.” Matheny pointed out that Davis based his figures on land area rather than per consumer and, like Archer, had confined his analysis to grass-fed ruminants. With Davis' mathematical errors corrected, this graph from AnimalVisuals.org makes evident the true number of animal deaths per calorie of food. It should be noted that Archer's more recent article bases calculations on deaths per gram of protein, further falsely skewing the results in favor of meat. Furthermore, Professor Andy Lamey, in his article in the Journal of Social Philosophy, criticized the studies Davis utilized for his statistics of field animal deaths. One study included deaths from natural predation, and the other examined the production of sugarcane, a rather nonstandard crop, which Lamey wrote has little relevance to deaths associated with typical crop production. Both Lamey and Matheny also argued that accidental deaths are ethically distinct from intentional ones, and that if Davis includes the accidental deaths of field animals in the cost of a vegan diet, he must also include accidental human deaths caused by his proposed diet. Now does this exempt vegans from owning the deaths we do cause? Absolutely not. We should certainly be aware of the harm we cause animals, whether intentional or not. The animals that suffer and die at our hands could care less about our intent. To them, the pain is the same. And I’ll be the first vegan to admit that I most certainly do inadvertently cause animal suffering. It’s inevitable. But that does not invalidate the vegan stance and the continual striving for the reduction of harm. And studies with flawed and skewed data do not either. 2003: Matheny says, “Umm….no it doesn’t.” With: science! 2008: Lamey says “yeah!” Also with: science! 2012: Moriarty says, “Umm….no it doesn’t.” With: science! 2014: I F*cking Love Science re-posts Archer and the Internet goes wild. With: conjecture! Now I need your help. Let’s make this post go just as viral as the article it refutes. Share it everywhere. Post and repost. 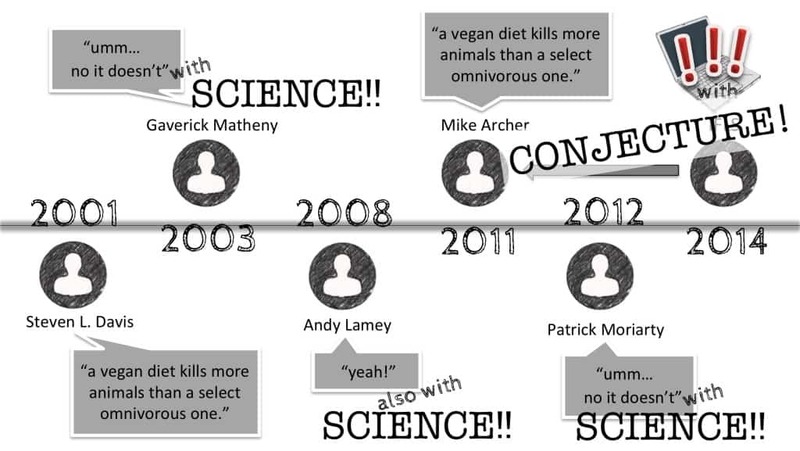 Tweet it to I F*cking Love Science to get the word out that veganism is a strong as ever and firmly rooted in science! And I'd love to hear from you! What are your thoughts in this topic? Let me know in the comments! Try not editing these every time you take a breath so that they are so jarring to watch. I would rather watch a video with a natural pace to it. thank you for the feedback Nick. ideally i would have them that way- with the time it takes to create the videos and the number i produce, i don’t have the time to memorize the scripts beforehand- so there is inevitably some jarring cuts. Well researched bite, Emily, thank you! Now, this discussion is all about grass fed beef/ruminant meat, right? Let’s assume for a second, just for the sake of the argument, that grass fed beef actually saved field animals’ lives. How far will this get us? Today, nearly 60% if this planet’s agricultural land are being used for beef, using land for pasture that could better be used for re-forestation to fight global warming and boost biodiversity, and more than one third of the grain supply. And yet, beef currently supplies less than 2% of global calories today Now, cut out the grain fed beef (since grain is a field animal killer, and we don’t want field animals’ blood on our hands, right…), and the contribution of beef to global calories will drop from nearly to fully negligible! So, we should drop this nonsensical discussion and produce some real food…. well done Hans- that’s what i came across as well in my studies for this. it’s simply not sustainable or feasible. let’s eat some plants! Actively grazed pasture fixes as much carbon as forest. Seems like getting food from the land in conjunction with carbon sequestration makes more sense in terms of best use, than sequestration alone. Also, does it need to be all or nothing? Isn’t some pastured beef also a valid option even if 100% pastured isn’t feasible? The data on land-use and sustainability seems to suggest it is. Nice response. But I’m wondering if there are actually as many rodent deaths as are being purported. This was a *very* interesting article I was delighted to find, with intriguing information. It really does make sense too–why *wouldn’t* animals flee when they see and sense a huge thresher coming? Not only all this, but the claim that eating meat causes more harm is bogus because it simply deals only with death, not quality of life. The case would be hard to make that the quality of life for animals in factory farms is even close to comparable to a wild field mouse. Yes, the field mouse may get killed by harvest, but they are essentially living happy lives up to that point, or at least lives not made unhappy by human activity. On the other hand animals living in cages and beaten and prodded and all of the crap that happens to farm animals are certainly living less than happy lives under human control. very true and important point. this was brought up in a couple of the refutations i read and is very valid. Except that Archer’s comparison wasn’t to ‘factory farms’ it was to ‘pasture fed’ beef. It is possible for cattle to have a comparable quality of life to a wild field mouse, maybe even better given the lack of predators, ample food and water. Arguments against factory farming are good ones, but the end result is not necessarily vegetarianism. I appreciate a vegan addressing the death of animals in the production of grains and vegetables. What you’re saying essentially is that it’s an empirical issue whether veganism leads to more death than carnivorism, rather than a moral issue. I only wish that the vegan community would recognize that fact and stop the arrogant and tedious condemnation of meat eaters as cruel and uncaring people. What about palm oil, many vegan products have this I frequent which is making orangutans and other Animals desapear. Could you address that? Vegans take medication, experiments kill a million mice a day in the USA. We all have blood some more than others but nobody is guilty free. I have a video on Palm Oil if you’re interested. You stated “veganism is all about causing the least amount of harm possible” but I think many vegans do cause some unnecessary harm. The thing I struggle with is that many vegans consume sugar, which is unnecessary for health and is just empty calories. This is problematic because growing sugar will inevitably cause death to some animals. With that being said, is there any way a vegan with the “least harm principle” could justify sugar consumption? i’m assuming you mean refined sugar? as sugar itself is something we cannot survive without- it’s the body’s energy source. i’ll actually be dong a video on sugar soon so stay tuned for that! Yes I meant refined sugar. Thanks for the reply! I really enjoy your site. Great article. Finally a good retort to this constant stupid statement by meat-eaters that a vegan diet causes more deaths than an omnivore die. Unless someone is totally innumerate and can’t add and subtract it is obvious that those that eat meat are causing more indirect and direct deaths since the death of field mice to produce grain are so much more on a diet that includes grain-fed (the majority of meat) meat. so glad this was helpful for you! and it is rather simple! Emily, I posted this on a vegans vs meat-eaters debate on facebook and you were given no credit for the article because of grammatical mistakes. The main criticism being that if you want your article to be taken seriously shouldn’t people’s names be in caos (for instance Archer instead of archer). Another person said anything called bite size vegan can’t be serious on face value but that’s just being picky. the format/style of this site is no-caps. it’s more of an aesthetic than having to do anything with the validity of the information. i try to make this approachable to ALL people- not just the well-educated and vegan-minded. I meant to say shouldn’t people’s names be in caps (Mike Archer not mike archer)? Hello Emily, I enjoyed reading your article. I will start by telling you that I eat a typical American diet. I eat more meat than is probably good for me. I shop at the supermarket for most of the meat I consume (chicken, pork and beef). My question to you is, if I go out to the forest and quickly kill one moose with one bullet I will receive between 300 and 400 lbs of meat I would then have enough for 1 year. Am I then more ethical than one that gets meat from factory farms or A vegan that is responsible for the deaths of animals that live in fields that are plowed and tilled? Thanks for the article. Hi Joe! thanks for your comment/question. personally, i don’t like to rank ethics when it comes to killing. to that moose you’re just as unethical, and to me that’s what matters. the fact a life was unnecessarily taken. i always put myself in the place of the animals. if you do that, the answer is simple. for that moose, it was his/her whole and only life. I’m sorry. I have to disagree with you. For every field mouse or other creature killed by harvesting plants, that too is their only life. Many small creatures don’t have as much right to life as one large one? What about the life of the plants consumed? There is evidence that plants have an awareness of their surroundings, and react to being eaten, and cut though humans without special devices cannot see or hear these reactions without special equipment. Life comes from death. It is the natural cycle. Even the soil that the majority of plants grow in comes from the death of plants and animal, that make up part of the soil. Today some of us have the leisure to live on a vegan or vegetarian diet, but it wasn't so for our ancestors. They evolved and thrived at their best by consuming a variety of food stuffs. Am I an advocate for the modern paleo fad diets? No. it isn't the diet that our free living, hunting and gather ancestors lived on. They were physically extremely active in getting food. No stores, markets or co-ops. They ate whatever they could pick, dig up, or catch. No obesity, or anorexia back then. What are we doing wrong today? (rhetorical question) They had to make their own tools as well. It is a fact that once humans settled down to a system based mostly on agriculture, and a diet high in cultivated foods, their physical health was not as good. That may have something to do with living on a much less varied diet, tending towards mono-cultures for their meat and non meat foodstuffs. We have luxuries our ancestors did not. While technology has given us longer life spans, and more "security". many of us are not healthy in that lifespan. There are far too many of us., and we rob the planet of habitats for our fellow creatures to live on. I don't want a cull on humans. I just think that based on what is known that any lifestyle, or diet that is too narrow in its focus is not "good" for the species, in the long run. Too much dependence on one, or only a few foodstuffs is dangerous, if something causes those food sources to disappear. It is a good thing that humans still can eat such a wide variety of things… pity those that aren't so flexible. We are not meant to be specialists.Whenever we over plant grassland, over hunt, or over fish, we damage the world for other creatures, and in the end damage our own long term chances for survival. Unless, and until humans come to understand how to live within the global framework/biomes that have existed for much longer than we have, the long term for every creature above the size of insects is going to be threatened. We must reproduce less, and intelligently. Enjoy your diet.Remember though, that for most of the history of the human, the diet you advocate would have been a death knell to the species that you belong to. Do I agree with the barbaric practices that are used in some(too many) places to put meat on our plates? Many have lost sight of the fact that these are also living creatures who have had their lives taken so we might continue ours. So it goes with plants as well. For every plant you consume, that is one less for another creature to consume. Nuts, berries, and roots, and plants that produce seeds in abundance make enough so that a reasonable population of consumers can eat, with enough left over to replenish the next generation of that particular plant. Other animals, no matter where they live, are regulated by the food supply available, be it plants, or prey. Populations adjust to changes from year to year based on the availability of food, and of course environmental factors. Humans have done much to step outside of, and completely ignore those natural checks and balances. We overload ares with population. We deplete and harrass indigenous plants and animals, and are dependent on our own domesticated stock for our food. These animals and plants do not have the same genetic variety, and are mono cultures that overwhelm the more natural environs on which they are placed. The diversity of the Earth suffers, with other animals and plants being pushed farther and farther to the edges of their ancient ranges, or even pushed to extinction. It is bad news for the plants and animals we do depend on because a virus, or some disease could have detrimental effects on such population with little genetic variety. We also need to be careful we don't unleash something into an environment without fully understanding the consequences of such tampering. Nature doesn't sit in a vacuum while we go on our merry way. If it can, it will adapt, and not always in the ways we would like, or have planned for… "nuff said"
Until our species gets a handle on population, education, and how to live within our means; until we understand how to prosper without it being at the expense of other lifeforms, and how to do that without exhausting the water supplies, exhausting the soil,polluting everything in our wake, and we have to stop acting as if we are the defacto owners of the planet. Just because we have large brains, opposable thumbs and advanced technology, that doesn't guarantee that we aren't going to mess up and mess up big. We aren't going to last to much longer if we don't stop quarreling over who owns what, who believes in what, and who should marry who. If we aren't careful, we are going to be the cause of our own demise as well as the demise of many of the other lifeforms we just happen to share the planet with. Seriously, there are days when I wish we could plunk down everyone, or sleep teach them, especially the politicians about what really is important, and keep at it until it sinks in…. The big picture…The long view. Maybe a steady diet of Mr. Dressup, Mr. Rogers, David Attenborough, Kratt's Creatures, Bill Nye, Neil DeGrasse Tyson, Carl Sagan( go ahead, I bet you can think of lots of good sources that could help!) and shows like that might help get the point across. Perhaps it was a terrible thing when our bright little ancestors stopped being placid vegetarians,started making and using complicated tools, and making meat a larger part of their menu. True, we would not be the beings we are today, but perhaps the earth would be greener, less toxic and we would simply be another interesting creature wandering through the various landscapes. Taking little, leaving little, and doing no lasting harm. Our ancestors didn't have the leisure, or the foresight to take the long view. They were busy living their day to day existence. We, on the other hand do have the time, and the resources to make long term decisions that will affect not just us individually, but our entire world. I'm not too hopeful that our intelligence is the boon we think it is. So far, it really hasn't been all that good for the planet, and far too many suffer, so that a few may prosper. That is never a good thing in the long run. From our earliest definite ancestors, we've been around a measly few million years. That's a flash in the pan as far as the age of the Earth and in comparison to many other species, we are still wet behind the ears. I worry that we may just end up as a messy footnote in the extended history of the planet, and it well may breathe a collective sigh of relief when we are no more. I rather hope that we figure it out, and soon. In a million or so years it would be great if those that have inherited this planet( hopefully our descendants) will remember us as the ancestors who got a lot of things wrong but finally sorted out our differences and priorities. I hope that there that there is a future for our species and that it is as good a one as can be hoped for, not just for our descendants but for all on this place we call home. I'm a physical anthropologist by education, with a side of geology, but under all of that I am a careful optimist who really hopes for a happy ending, well at least until the Sun expands and fries the inner planets… that's a few billion years away, and of course barring some comet or asteroid plowing into us, or super volcanoes erupting( that will make dietary choices a moot point). Even then, in the long long term, everything is going to get recycled into new things that we won't be around to comment on. Unfortunately, some of it is factually incorrect. I’ll quote you and share my response, and I’ll try to keep it brief. I’ve covered this in detail in my rebuttal to Mike Archer. TL;DR: Mice are independent for 95% of their lives, and are almost never killed when food is cultivated for vegans. Far more mice are killed when pasture is cultivated for cattle. No, just no. There is no evidence that plants are sentient. Zero. None. And I invite you to share PEER-REVIEWED studies of plants being sentient, but you won’t find any, because there is none, because they aren’t. That’s poetic and all, but life comes from life and cooperative symbiosis far more often than it comes from death. “We would not have developed into the intelligent species that we have, if it hadn’t been for the introduction of meat protein in higher proportions in our prehistory. Hunting requires intelligence, therefore, evolving into an intelligent (more intelligent) species precludes hunting. Duh. There is evidence that the growth of human brains really took off when we incorporated starches into our diet. Cooking converts starch into sugars, which the brain needs. More sugars = bigger brains. Brains run on sugars, which are found in abundance in plants, but are nearly absent in meat. The brain does not require much protein to function. This also makes sense because roots and tubers are far easier to obtain than meat. And brain growth has to be stimulated by evolutionary pressures, and has very little to do with diet. Highly intelligent animals include herbivores (great apes, yes, including chimps, 98% of whose diet is plant matter), parrots, pigeons … omnivores (corvids, pigs, dogs) and a small minority of carnivores (cetaceans). Most “protein” eating carnivores are, actually, quite stupid. Ask anyone who’s ever had a cat. Absolute rubbish, my dear. :) There simply aren’t enough scavenging opportunities on the savannah. Most kills are consumed by vultures because they have an aerial “information network” that lets them find carcasses easily. Finding an occasional carcass is not enough to sustain any evolutionary change. All carnivores in our ancestry are also extinct. Ever wonder why? Because they’re ancestors, that’s why. On the other hand, the majority of our evolutionary cousins have a largely or fully herbivorous diet. "Today some of us have the leisure to live on a vegan or vegetarian diet, but it wasn't so for our ancestors." Actually, obtaining vegan food has always been easier than hunting meat. This is why the rise of agriculture led to the first permanent settlements, then the pursuit of specialized arts, trade, the first cities, the first empires, cultural exchange, knowledge accumulation, competition and scientific research, ultimately culminating in the design of the computer you're using. Plant cultivation is the reason you're reading this, and having the ability to eat starches is why you have a brain to understand this. "They ate whatever they could pick, dig up, or catch. No obesity, or anorexia back then." They also had shorter lifespans. "While technology has given us longer life spans, and more "security". many of us are not healthy in that lifespan." Vegans are still healthier than most. "There are far too many of us., and we rob the planet of habitats for our fellow creatures to live on." Which is why a vegan diet is so important for our planet. It consumes the least land, the least fresh water, and pollutes the least. Look up appropriate studies please. The Cowspiracy website lists plenty. "I don't want a cull on humans." What you SHOULD want, is a vegan or almost-vegan diet for the majority, and the end of animal agriculture. "I just think that based on what is known that any lifestyle, or diet that is too narrow in its focus is not "good" for the species, in the long run. Too much dependence on one, or only a few foodstuffs is dangerous, if something causes those food sources to disappear." Plants will be the last thing to disappear. We'll die out before our food does. Can't say the same about animals, can you? "It is a good thing that humans still can eat such a wide variety of things… pity those that aren't so flexible. We are not meant to be specialists." Vegans are anything but specialists. Do you know what's a specialist? A panda. It only eats bamboo. Or a lammergrier, which feeds on marrow. That's a specialist. Not a creature that eats fruit, seeds, grain, leaves, starches, legumes, beans and more. "Many have lost sight of the fact that these are also living creatures who have had their lives taken so we might continue ours. So it goes with plants as well. For every plant you consume, that is one less for another creature to consume. Nuts, berries, and roots, and plants that produce seeds in abundance make enough so that a reasonable population of consumers can eat, with enough left over to replenish the next generation of that particular plant." Please, just stop. Plants use us as means of reproduction. They produce fruits (and veggies) so that their seeds are spread around. Grain are only harvested after the plant dies. Same goes for many underground plants, like potatoes and garlic. They rely on being consumed for their propagation. Do you have any sources that support the claim that cultivating *pasture* rather than *grains* results in more mice deaths? Most of these statements from the commenters above are unsubstantiated with sufficient factual evidence to fully verify the veracity of such statements. No one can conclusively demonstrate a point one way or another and the arguments start to fall into the area of ridiculousness. For example, when a field of vegetables is being grown and eventually harvested, there is a distinct possibility that hundreds (or thousands or more) insects are being killed in the process. Herbicides, pesticides, tractor tires, human hands or feet, etc. may be contributing to many thousands of deaths. Who is being mindful of all of the insect (not to mention the various amoeba) life being taken? Is not the life of each insect or amoeba just as valuable as the life of each cow or human in existence? Many vegans fail to value the life of insects in the same proportion as the life of larger breathing organisms like chickens, fish and sheep. I am a vegan but for dietary purposes only. I don’t start to engage in the greater discussion of ‘preserving all life’ because such a notion is simply ridiculous. Most humans kill life in some way, shape or form everyday and probably are not aware of that fact or else ignore that truth. Step on a tiny bug you don’t even notice? A life has been taken. Drive over an ant in your driveway? A life has been taken. The only surefire way to stop taking other lives on this earth is to take one’s own life and then that person no longer risks taking the life of some other living organism which only has you to blame for ending its life. That act of removing one’s self from this earth so that on other life can be taken is true veganism (beyond being a vegan simply for dietary purposes). The past couple of years, I’ve had a couple of raised garden beds which provide (as I get a greener thumb) increasing amounts of the food I consume. I use the Ruth Stout no-till method, which (I just realized this) limits the amount of underground life harmed by my food production. Also conserves water and eliminates most if not all the need for fertilizer and pesticides. From an animal harm or environmental perspective, do you see any downsides? I also eat some of the edible weeds that appear on our property — yellow clover is especially tasty, purslane’s not bad either. Thanks Emily for you research, time and effort. Love your work. Paragraph 7: ‘means 250 million actress of grazing pasture’. I think you mean acres. Thanks for a thought provoking article Emily. I’m curious as to why you think examples of US factory farming or Brazilian rainforest clearing are valid counter arguments to a case made in an *Australian* article about *Australian* cattle. I’m not sure I see the link between an Australian consumer eating pasture fed beef and the clearing of a the rainforest. I hate that it’s been years since you posted this video and people are still circulating this ridiculous rumor. To be honest I believed it too until a year or so ago. The things people will tell themselves to confirm what they already believe defy basic logic. Oh I KNOW! That’s a huge part of why I’m working now as hard as I can to get help and a team in place so that these video resources CAN reach more people :) Of course there will always be the same arguments based on non-facts. But the more we can get accurate research-backed info available, the better. I’m skilled at making them but not at the “distribution.” ;P SO glad that this was helpful for you! Your arguments against rainforest destruction may be valid for cosumers in BRAZIL. Australia is a huge country with masses of natural pasture land – there are no rain-forests being cleared for Australian beef. How is rainforest destruction in Brazil relevant to the choices faced by an Australian consumer? Also as only 3% of all the sheep and cattle in Australia is grain fed at any one time it’s trivial to source only pasture fed meat via the PCAS certification standard. The vast majority of meat may be feedlot based in other countries but NOT IN AUSTRALIA. Once again, how are your arguments against grain fed cattle as produced in other parts of the world relevant to the choices faced by an **Australian** consumer? Why is this falsely skewing? There is a minimum amount of protein a person must consume, and it has to come from some source, either plant or animal. Calories on the other hand include high calorific crops, but not all calories are equal in terms of nutritional requirements and such crops may meet your daily calorie needs without meeting daily protein needs. I can’t see how your arguments refute the Archer article which was very clearly scoped to Australian consumers. They may, however, refute the article being used by people to justify meat consumption in *other parts of the world*. The best response to the article remains ‘that may be true in Australia, but it is unlikely to be valid elsewhere’. Sean, while some of the article’s claims fall down in Australia, the majority still withstand scrutiny. For example, a significant proportion of Australian grain and cereal is slated for animal consumption as we also have a huge poultry and pork industry (all of which eat primarily grain/cereal based feeds). I’ve forgotten the number but it’s easily researched. Domestic consumption of grains etc is quite small compared to the livestock feed and export components. So in that sense at least a large number of incidental animal deaths in harvesting directly supports the meat industry. Secondly, land clearing for grazing is still a substantial issue here as well. Look at the recent problems with clearing in Queensland for beef cattle, and the land degradation issues throughout northern Australia associated with grazing activities. In terms of mouse deaths, it is true we have a problem with mouse plagues, but there have been some calculations I have seen that propose that on the broader view, this may not be to the extent that people seem to think. See Geoff Russell’s commentaries on the SA Animal Lib site. I think Animals Australia also has a take on this. That said, it is true that extensive grazing on marginal land is, in Australia, seen as a good strategy for land management. I’m not personally convinced of this but haven’t been able to track down any useful research. One other factor rarely commented upon is that arable land in Australia is limited and suffers in competition with other uses (eg urban, mining, dairy etc), and what arable land there is faces declining yields. I’m not quite sure how we can tackle this in future though there have been some recent summits to consider the problem. One thing that worries me in this respect is that the livestock industry actively courts overseas markets, as like any industry it seeks to gorw and be more profitable. Given that so much production is slated for overseas consumption and yet all the negative impacts are domestic, we might need to rethink our headlong pursuit of animal agriculture on both pragmatic as well as ethical grounds. i.e. he is *very* clear in the *types* of red meat he is recommending so why do you believe that grain use by the pork and poultry industry cause his claims to ‘fall down’ given that he recommends neither pork nor poultry. Surely land clearing is a problem for *all* types of food production? And as you state later, the arable land in Australia is degrading so there would appear to be little value in the claim that grazing causes pasture land degradation as a point of of differentiation. Interesting article, wondering what your take on vat grown meat is? I have a video on that here, if you’re meaning lab-grown meat? Another point that is NEVER discussed by the meat proponents on this topic is the fact that ‘grassfed’ cattle in temperate and cold climates are fed hay during winter. The meat pushers NEVER factor in the rodent, reptile and bird deaths that occur during pasture mowing, raking and baling (those are the Australian terms, US terminology may be different). I’ve actually seen an article that claimed ‘vegans cause more deaths’ that had a photo of cattle eating a bale of hay included in the article. As a landowner (ex sheep breeder, now vegan) who produces hay I can guarantee the deaths would be at least equivalent, if not higher in the hay making process. That’s a really good point that I also noticed on researching this topic. In Andy Lamey’s paper “Field Deaths in Plant Agriculture”, he references a study by Bollinger (1990) Effects of hay-cropping on eastern populations of the bobolink. Bollinger found a 94% mortality rate among this small North American blackbird, after the mowing of hay fields. Great point . Intensive cropping means no other life in the fields to be killed . Because there will be none .